The iPad is generally one of the most durable and bug-free tablets on the market, but like any computer, it can have problems. And of all of them, getting stuck at the activation or "Hello" screen is the scariest, especially if you recently performed an upgrade to the newest version of the iOS operating system or reset the iPad to "factory default" settings. The good news is that you should be able to get your iPad up and running. Unfortunately, the bad news is that you may need to restore the iPad from the most recent backup. Many people don't realize that simply pushing the Sleep/Wake button at the top of the iPad doesn't actually power down the device, which is an important first step in troubleshooting. If you are at the 'Hello' screen or the 'Slide to Upgrade' screen, you may have problems doing a normal reboot. A hard reboot is when you tell the iPad to shut down immediately without any confirmation. First, press and hold the Sleep/Wake button. If a query to Slide to Power Off pops up on the screen, release the Sleep/Wake button and follow the onscreen prompts. This is a normal reboot. If you do not see the Slide to Power Off after a few seconds, simply continue holding the Sleep/Wake button down. After about a half minute, the iPad will power down automatically. This is a hard reboot. The only difference between a soft reboot and a hard reboot is that you weren't asked to confirm powering down the device. 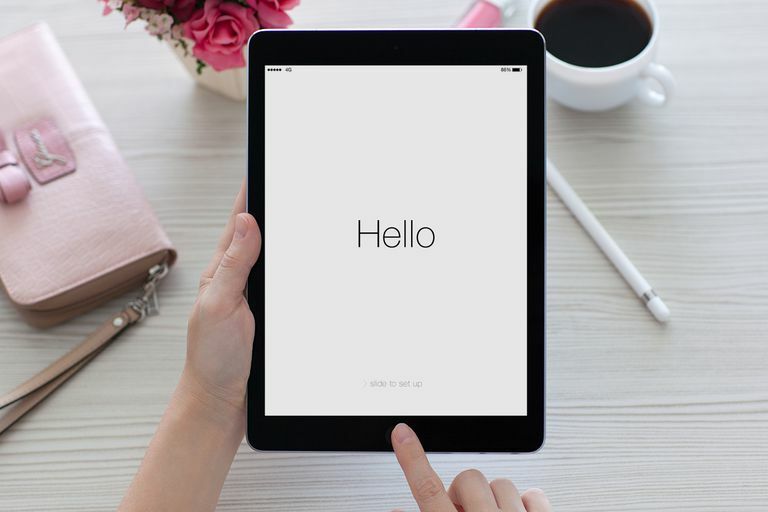 The hard reboot is a failsafe put in place in instances where the iPad may not be able to ask you to confirm, such as freezing during the activation period or during an update. After the iPad powers down, wait about ten seconds and then hold down the Sleep/Wake button and the iPad will power back on. You can lift your finger when the Apple logo appears on the screen. Hopefully, simply rebooting the device will solve the issue. If you still have problems, you can try repeating these steps, but instead of immediately powering the iPad back on, you can plug it into a wall or a computer for an hour or so to let it charge. This will eliminate any problems caused by the iPad being low on power. While I wouldn't call rebooting the iPad a long shot, a problem with the iPad not getting past the 'Hello' or set up screen often requires resetting the device to its factory default setting. Unfortunately, this is where the biggest problem can occur. You can only restore your iPad through iTunes if you have Find My iPad turned off, and you can't turn off Find My iPad if you cannot get into your iPad. If you're not sure if you have it turned on? You will be notified in iTunes when attempting to restore the iPad. If you have Find My iPad turned on you can attempt to restore the device remotely through icloud.com. If you have Find My iPad turned off, you should be able to restore the device via iTunes. First, make sure your computer is turned on and iTunes is open. If you don't have the latest version of iTunes, download it first. Plug your iPad into your computer using the Lightning connector that came with the iPad. Normally, iTunes will recognize your iPad. If you've never plugged it in, you'll be asked to confirm that you want to Trust this computer. Once you've trusted the computer, you can click on the iPad button on the top-left side of the screen next to the Music, Video and Computer buttons. This will take you to a screen with a Restore iPad options. However, because the iPad is frozen at the activation screen, the computer doesn't always recognize it. If the computer does not recognize the iPad, press and hold both the Sleep/Wake button at the top of the iPad and the Home button just below the iPad's display. After holding down both of these buttons for a few seconds, iTunes should prompt you to restore your device. After you have restored the iPad, you can set it up normally just as you did when you first got the iPad. If you have a backup stored on iCloud, you will be asked if you want to restore from an iCloud backup during the process. If you are still having problems with your iPad, you may need to try putting the iPad into recovery mode. This is a mode that skips certain protections and doesn't offer you the opportunity to backup the iPad first, but it can help you get back to the factory default mode.